After verifying the hare's authenticity at Durrants Hotel, Williams took it to the nearby Portal Gallery, where he planned to make it the centrepiece of his new exhibition. He saved this as a surprise for the guests packing the gallery that day, who had come expecting to see only a selection of the paintings Williams had done since dropping from the public eye. 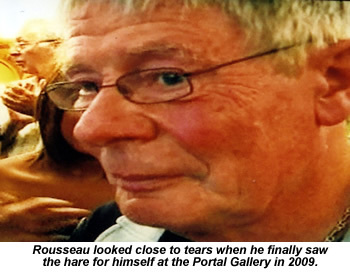 The BBC Four team invited Barker and Rousseau to attend the exhibition with their families, but deliberately gave them no clue that the hare would be there. This piece completes my trilogy on remarkable 20th Century treasure hunts. You can find the other essays here (Treasure Hunt Riots) and here (Lobby Lud). For more information on Masquerade, including a page-by-page guide to the book's paintings, visit Dan Amrich's website: www.bunnyears.net/kitwilliams/. As I write this in February 2010, the Radio 4 Masquerade documentary is still available online via this BBC website. The RealPlayer prompt you'll need is at bottom of their story. 1) The Man Behind The Masquerade (BBC Four, December 2, 2009). 5) Masquerade: Kit Williams Tells The Answer to The Riddle, by Williams Williams (Jonathan Cape, 1982). 6) Quest for the Golden Hare, by Bamber Gascoigne (Jonathan Cape, 1983). 7) The Grand Masquerade (BBC Radio 4, July 11, 2009). 8) E-mail correspondence, January 2010. 9) Friday Night Saturday Morning (BBC 2, February 22, 1980). 10) Personal interview, April 2009. 11) Nine O'Clock News, BBC 1, March 14, 1982. 12) Blue Peter, BBC 1, November 24, 1988. 13) The Sunday Times, December 11, 1988. The Sunday Times gives Veronica's surname as “Robertson” rather than the “Roberts” used elsewhere. I've changed their reference here to avoid confusion. 16) The Independent, July 17, 2009 (http://www.independent.co.uk/arts-entertainment/books/news/mysterious-golden-hare-still-casting-its-spell-30-years-on-1750107.html). 17) BBC News website, August 20, 2009 (http://news.bbc.co.uk/1/hi/entertainment/arts_and_culture/8212244.stm). 19) Evening Standard, February 1982. 20) The Observer, March 7, 1982. 21) The Daily Telegraph, April 4, 1982. 22) Evening Standard, April 2, 1982. Masquerade, and left quite enough money in her estate to fund the whole scheme. Who better than a detective novelist to dream up the infinite complexities involved? In 1983, Dale finally agreed to seek psychiatric help. It would be another five years before the true story behind Thomas's find emerged. It's easy to laugh at Dale's delusions - a process I've been happily nudging along here. But we should not forget there was a great deal of genuine suffering involved too. He first told his story in a series of letters to Bamber Gascoigne, who was then researching his Masquerade history Quest for the Golden Hare. He allowed Gascoigne to reproduce extracts from these letters only on the condition that their author be given the pseudonym Richard Dale. Gascoigne's last letter from Dale came in November of 1982, begging him not to write any more as Dale feared his own disturbed mind would spin further conspiracies from even Gascoigne's most innocent remarks. This is an expanded extract from my Masquerade piece in The Idler's Spring 2005 edition (Idler 35). The information is drawn from Gascoigne's book.